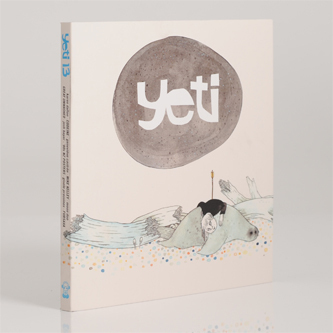 **Softbound 192-page book printed on glossy, heavy duty paper with oversized cover flaps - one housing a 7" with four exclusive songs** Yeti return with a crammed 13th edition housed in "wraparound" cover by Geneviève Castrée. Inside you'll find classic posters from the Christchurch, NZ '80s scene, originally designed and printed by Stuart "Kawoski" Page of Axemen, plus a lengthy oral history of American shoegaze rockers Codeine by Mike McGonigal; a batch of recent paintings by David Moreno; introduction to the great/forgotten Surrealist writer Gisele Prassinos by Sarah Lippincott; found photos selected by Mark Sullo; 'Seven Bedtimes for Seven Bonzos' by Ben Bush; Fursaxa interview and collages by Ilyas Ahmed; mammoth comic work 'ORM: Part One' by Josh Bayer; and much more. Phew!